The fallout from the Danske Bank money laundering scandal has rattled the European financial system as $235 billion that flowed through the bank's tiny Estonian branch - an amount that dwarfs the Baltic nation's GDP - has been deemed by the bank's auditors to be suspicious. And while that might seem like a staggering sum and raise questions about how regulators on the Continent managed to overlook this, the full scale of the money laundering that took place in the Baltics is even more staggering. 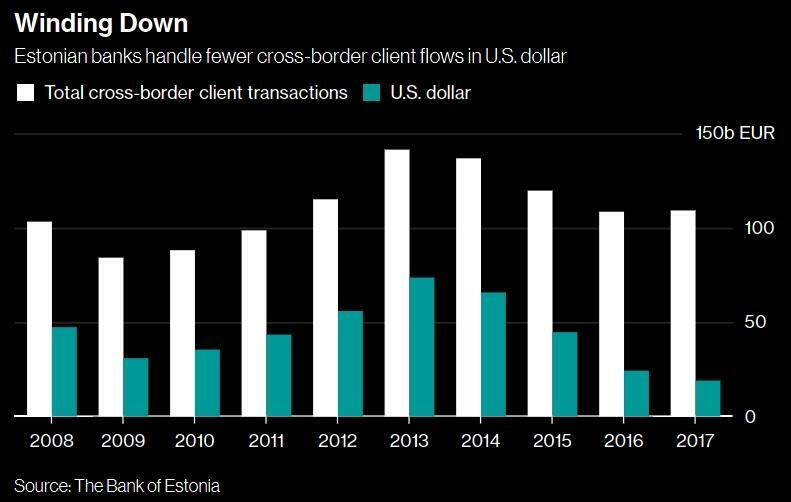 According to data provided to Bloomberg by the Estonian central bank in Tallinn, Estonian banks handled about 900 billion euros, or $1.04 trillion, in cross-border transactions - a figure that includes the highly suspect non-resident flows - between 2008 and 2015. The central bank added that it wouldn't be fair to say that all - or even the majority - of these non-resident flows would constitute money laundering. But then again, the notion that these foreign individuals and investors would choose to run such a large sum of their money through Estonia for explicitly legitimate purposes is difficult to swallow. "The fact that other banks may be conducting their business in a similar way hardly detracts from Danske’s guilt," said Mark Galeotti, an organized crime expert and senior researcher at the Prague-based Institute of International Relations. With the echoes of the liquidation of ABLV, formerly the third largest bank in Latvia, still reverberating through the Baltics (the bank collapsed after it was caught laundering money for North Korea, eliciting a "death penalty" sanction from the US Treasury), Bloomberg published a story on Wednesday highlighting the fact that money laundering by non-residents isn't just endemic to Estonia - it has endemic to the entire Baltic region (and possibly all of Europe). One sign that illicit banking has been on the rise in the Baltics is that the share of dollar-denominated flows as a portion of all non-resident flows has been on the rise. The problem with handling dollars is that they require a third-party correspondent bank to become a party to the transaction. Because these banks can also be found liable for facilitating illicit transactions - and AML controls in the US banking system, while imperfect, are widely considered the strongest in the world - criminals often prefer to transact in euros (or better yet, Swiss francs). Indeed, several US banks raised the issue of non-resident flows through Danske's Estonian branch, and, when they were ignored, refused to continue clearing these transactions for Danske. Given the deluge of embarrassing headlines that have been generated by the Danske scandal, there's little doubt that the regulatory scrutiny from regulators in Europe, London and the US will make it virtually impossible to launder dirty money through Baltic Banks. But anybody who thinks this will ultimately put a stop to money laundering in Europe is being naive. Because as one compliance expert told Bloomberg, these regulatory holes exist throughout Europe. John Horan, senior associate at Maze Investigation, Compliance and Training Ltd. in Belfast, says money laundering is a Europe-wide problem. "I’ve worked on AML in the Baltic states, and I haven’t seen anything worse there than I’ve seen elsewhere," he said. While it might be briefly disruptive, dark money will almost certainly continue to flow through the European banking system like sand through a sieve.